BANGI, 22 Nov 2012 – Reserve Officers Training Unit (ROTU) cadets from The National University of Malaysia (UKM) had undergone shooting training at Camp Hobart in Gurun Kedah during the mid semester break recently to expose them to the use of weapons and shooting. A total of 338 officers took part in the training to also enble the senior cadets to hone in their shooting skills and to instill closer cooperation with volunteer officers and trainers of the UKM ROTU. ROTU volunteer reserve officer, Major Mohd Jasmy Abd Rahman said 15 trainers and 12 volunteer officers also took part in the shooting training. The training session includes map reading, marching with weapons, Intelligence Preparatory of Battlespace, Training Exercise Without Troops (TEWT) and signals held at the Sungai Besi and Asahan (Malacca) Camps. During the shooting sessions the cadet officers had the opportunity to use the M-16 rifles as well as M-203 GPMGs (General Purpose Machine Guns) mounted on their tripods for long range firing. Major Jasmy said the officer cadets were very fortunate to be able to use the machine guns as it is rarely used for ROTU training. He was satisfied that quite a sizeable number of the officer cadets have the potential to imporve their shooting skills based on the results of the shooting. He believes the cadets could enhance the good name of UKM especially in shooting competitions. 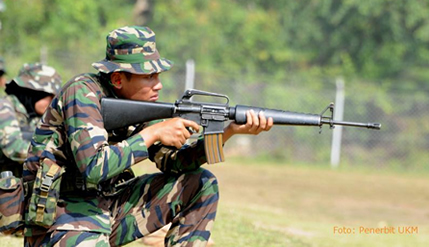 UKM already have a 25 metre shooting range for pistol firing in the campus that could be used by the ROTU cadets. Major Jasmy is confident that with consistent training and support from the university, more shooting champions could be nurtured from among the cadets, the volunteer officers and trainers. The officer cadets needed to undergo all the training provided and assessed during their three years of study at UKM to maintain their credit hours as sacrifices made for the training was more onerous that those taking up culture and the arts or sports. It was only after undergoing such training would the officer cadets be eligible to be commissioned as Second Lieutenants by the Yang Di Pertuan Agong. 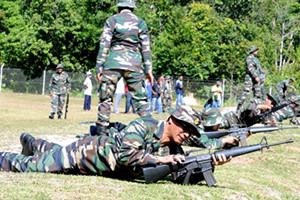 Head of the UKM ROTU Training, Lt Col Mohd Sahar bin Haji Said said armed with such training, the officer cadets can be model citizens to other students while also being imbued with the determination to be competitive both in the university as well as when they entered the job market after graduating. Nonetheless the training they received are just the basic necessacity before being commissioned by the Agong and could be continued should they want to join the armed forces or as volunteer officers in the Territorial Army. 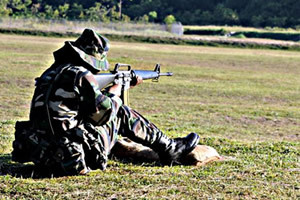 The three day shooting session ended with a shooting competition using M-16 to fire at plates from 200 and 100 metres. In the finals the volunteer officers dropped all 10 plates against only nine by the trainers.